What is the British prime minister afraid of? 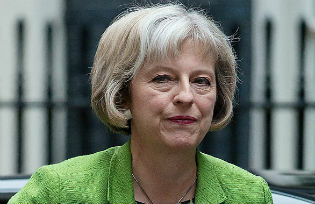 She is no longer a woman of her word, but a woman running scared, knowing she will have to compromise, afraid of the insane hard-liners in her own back-benches who have never trusted a remainer like her anyway, wanting to ‘be in control’ over the whole Brexit negotiation, including its compromises, and running for presidential authority over it. So, the prime minister is for turning. The reason Theresa May gave for her ‘cut and run’ general election does not convince. The personal cost to her will be very great. Huge, of course, if she loses. This is most unlikely – but nothing is impossible if Labour pro-remain voters swing behind the Lib Dems tactically. Even a Tory majority of 35, double their present advantage, would be a more than significant, moral defeat. Even if May gets the majority of 100 plus she hopes for, the prime minister is irreparably damaged. She had record-breaking personal ratings because she seemed to be different, a woman who did what she said, someone who did not, as she put it, ‘play games’. A woman of quiet conviction. Less belligerent than Thatcher, but all the more Christian and less self-interested. A woman of her word, who got on with the job. Now she has broken her word. One that was much pledged since she declared her candidacy and stated there would be no general election until 2020. A pledge she and her spokespeople have repeated firmly ever since. Now all this has evaporated. She is just like the rest, only worse. She is no longer a woman who keeps her word, she plays the game, she is a fixer like the rest of them. But without the charm, guile or reading, or even a good excuse. Why has she risked such a cost? Her claim that ‘the country’ is uniting behind her vision of Brexit but Westminster is not doing so, hardly bears consideration. To blame the weakest opposition in recorded history for forcing her to U-turn is implausible. Millions of people must go to the polls because Jeremy Corbyn is not being cooperative enough? Pull the other one. This morning she explained her change of mind saying, “Since I became Prime Minister I have said that there should be no election until 2020, but now I have concluded that the only way to guarantee certainty and stability for the years ahead is to hold this election and seek your support for the decisions I must take”. But what has changed? She does not tell us. What are ‘the decisions she must take’ that she wants voters to support? She does not spell it out. It is not the decision over Brexit, that has been taken. As general rule, if you smell something fishy, there is a rotting fish. The only real clue is where May says, “If we do not hold a general election now their political game-playing [i.e. the ‘game playing’ of the opposition parties] will continue, and the negotiations with the European Union will reach their most difficult stage in the run-up to the next scheduled election. Division in Westminster will risk our ability to make a success of Brexit and it will cause damaging uncertainty and instability to the country”. This is about as opaque an explanation as it is possible to get. In fact it is an attempt to confuse. To understand what she is saying you have to turn to the real power in the land for the next few years at least, the European Union. Everyone who wants to know what is going on in Britain today needs first to read the EU’s official response to May’s letter triggering Article 50. The Council’s guidance on the Brexit negotiations. It is reproduced here by the Financial Times with handy side notes by Alex Barker. Two passages stand out, first: ‘nothing will be agreed until everything is agreed’. This means that the costs the UK must pay for leaving, the rights of EU citizens and their families, the initial terms of a post-EU trade deal, everything remains in the pot to be stirred until March 2019 when everything will have to be finalised. There may be some agreements in principle beforehand, but nothing will be completed. It means there is going to be considerable uncertainty for the City and business right up until the last day and night of the negotiations. The EU will want a good trading relationship with the UK and at the same time it will want Brexit to hurt and has said it must do so. The best way of achieving this is for the EU to draw the process out. But all the vested interests of the UK’s finance and business have told the government they want less uncertainty and a good transition. So May and company are already well on the back foot. To the extent necessary and legally possible, the negotiations may also seek to determine transitional arrangements which are in the interest of the Union and, as appropriate, to provide for bridges towards the foreseeable framework for the future relationship. Any such transitional arrangements must be clearly defined, limited in time, and subject to effective enforcement mechanisms. Should a time-limited prolongation of Union acquis be considered, this would require existing Union regulatory, budgetary, supervisory and enforcement instruments and structures to apply. This will make British officials in Whitehall recoil. In far more explicit language than expected, the EU is saying that a gradual transition out of the single market — the prolongation of the acquis — will basically require Britain accepting all the obligations of membership. In other words, that means adopting EU laws, even when they change. It means accepting the European Commission’s right to check those rules are properly applied. It means paying budget contributions, and accepting the supervisory decisions of EU regulators and agencies. And perhaps most difficult of all it means accepting the “enforcement” structures of the EU — which ultimately runs to the European Court of Justice. This passage cuts straight across many of Theresa May’s objectives for Brexit, including leaving ECJ jurisdiction and taking control of free movement. This is what has changed. Across the last two weeks it has become clear to May’s team that there will have to be an extensive transitional period. As the Irish Times reported, a senior Irish official in close contact with the UK over Brexit said, “I see signs in the contacts that we’re having, both at EU level and with the UK, of a gradual realisation that Brexit in many ways is an act of great self-harm, and that the focus now is on minimising that self-harm’. The only way to do this is with a transition agreement. But the EU have told the May government that if this is what the UK wants it is fine by the EU; however, the UK will have to remain within the full legal framework of the EU and this is non-negotiable. In short, what has changed is nothing to do with Westminster, or the balance of power in the UK. It has dawned on the Prime Minister that by the time of a 2020 election, instead of the UK having left the EU with a trading agreement as she dreamt, it will still be paying its dues and paying a large leaving bill and still be under European Court jurisdiction and may still even have to accept free movement. Only by 2022 at best can she hope to have realised her Brexit. The EU response to their Article 50 letter ruined May’s 2020 election scenario. To have simply pushed ahead meant an election suffering the worst of all worlds, a hard Brexit in principle and continued membership in fact. Ideally, the best response would have been to call an election next year, so they could go to the country again in 2023. But that would have meant calling for a mandate in the middle of detailed Article 50 negotiations and disrupting a time-constricted process. Whereas now, before the EU heads of government have yet to meet to confirm their approval of the proposed guidelines, and prior to the negotiations starting there was a chance – a last chance. If they wanted to push back the next election, they had to go straightaway or not at all. The case of the cut and run election of 2017 has nothing to do with what the Prime Minister claims it to be. It is not due to the strength or awkwardness of the opposition. She is cashing in her cards as a woman of conviction to position herself for re-election in 2022, thanks to the EU busting her plans for 2020. She is no longer a woman of her word, but a woman running scared, knowing she will have to compromise, afraid of the insane hard-liners in her own back-benches who have never trusted a remainer like her anyway, wanting to ‘be in control’ over the whole Brexit negotiation, including its compromises, running for presidential authority over it. If she gets her way now, it will end badly. The best outcome is that she does not. All those opposed to her authoritarian approach, whether you are for Brexit or not, should join forces and support the candidate most likely to defeat the Conservatives in any constituency that they might win. Anthony Barnett (@AnthonyBarnett) is the co-founder of openDemocracy. If you want to buy a subscriber copy of Anthony Barnett’s THE LURE OF GREATNESS: England’s Brexit and America’s Trump, you should get your copy by June. Otherwise it will be published at the end of August. You can get it from the Unbound website.